Article taken from Women’s Voice magazine, 1977. In October 1977, National Front leader Martin Webster staged a one-man march in Hyde, protected by an estimated 2,000 police officers. A counter-protest was carried out by 20-year-old Ramila Patel of Bolton Asian Youth Movement, who walked in front of Webster carrying a placard that read (on the rear): ‘This man is a Nazi’. Ramila managed to walk about 80 yards before a policeman grabbed her placard and broke it in half. 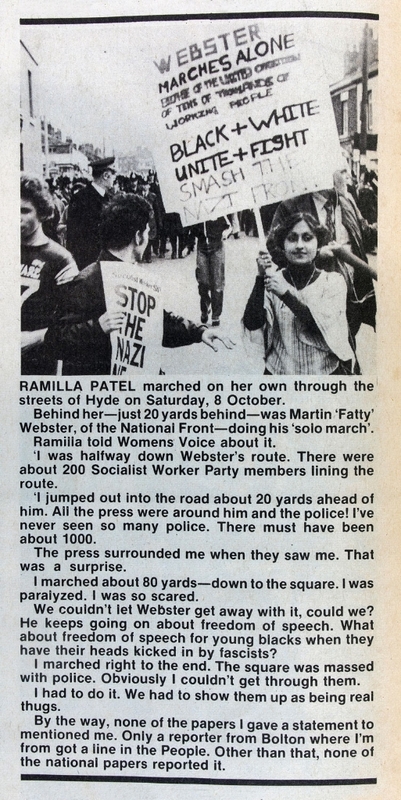 Following her brave stance against National Front leader Martin Webster, Ramila Patel, aged just 21, addressed the rally at Strangeways that preceded the Northern Carnival against the Nazis at Alexandra Park in 1978.